Art Brussels is pleased to announce its artistic programming for the 34th edition of the fair, which will take place in a new location, Tour & Taxis, a stunning example of monumental industrial architecture from 1904. 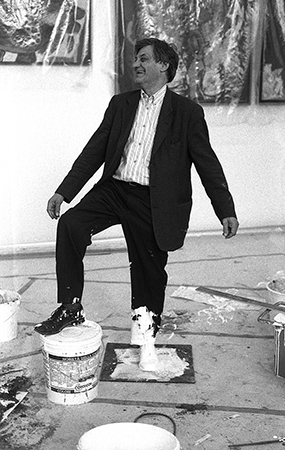 The flagship artistic project for Art Brussels 2016 is Cabinet d’Amis: The Accidental Collection of Jan Hoet, presenting the collection of the late, internationally acclaimed Belgian curator Jan Hoet (1936–2014). Hoet’s collection is highly idiosyncratic. It is the result of relationships forged with artists throughout his career, not a strategically assembled accumulation of works of art. Many works were gifts from artists, resulting in a collection joined not by design or intent, but almost by accident, with no deliberate intent to form “a collection.” Of the over 500 works in the collection, most are modest in scale. The exhibition pays tribute to Jan Hoet but also provides insight into his artistic vision and his relationships with artists. It also includes unique documentation in the form of photographs, letters, correspondence with artists, notes, postcards, artists’ sketches and drawings, collages, objects, faxes and texts from Hoet’s personal archives, which in turn give unique insight into his curatorial trajectory, and which have never before been accessible to the public. On the occasion of Cabinet d‘ Amis, Art Brussels and Contemporary Art Heritage Flanders (CAHF) co-organize a series of conversations and readings on contemporary collecting, in the company of the exhibition. For the full programme see the website. For the first time, Art Brussels is also adding a sculpture route to the fair, entitled OUT OF THE BOOTH. As visitors navigate the fair, they will discover 12 sculptures dispersed throughout the building, outside the gallery booths, at key locations in the space. These works are by 12 international artists working in the medium of sculpture: Nathan Coley (UK, 1967), Johan Creten (Belgium, 1963), Brian Duggan (Ireland, 1971), Kristof Kintera (Czech Republic, 1973), Honoré d’O (Belgium, 1961), Visible Solutions LLC (Estonia, 2010), Leon Vranken (Belgium, 1975), Hank Willis Thomas (US, 1976), Finbar Ward (UK, 1990), Clemens Wolf (Austria, 1981), John Wallbank (UK, 1990) and Raphaël Zarka (France, 1977). Highlights of the artistic programming also include a special installation by Rafaël Rozendaal (Netherlands, 1980) entitled Complex Computational Compositions conceived especially for the entrance of the fair. Here, Rozendaal will present a special montage of his websites, juxtaposing some of his classic sites with new creations where viewers will experience an ever-changing display. The scenography for Art Brussels 2016 is by Tom Postma Design.